Now Available: October Speaker, Marisabel Dolan of Nexant Inc. has provided a copy of “Staying Competitive in a Feedstock Driven Market.” If using information from this download, please attribute to Nexant Inc.
Thursday, Nov. 19 Career Day at the Chem Show Details. December event - Joint Event with ASME, Metro NY Section. Details soon. 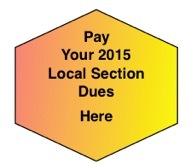 If you didn't pay your Local Section Dues ($10) with your Annual Membership Renewal, you can do so here. Also, good for Non-AIChE Members who wish to join the Metro New York Section. Details: Thursday, Nov. 19th, 1- 3:30 pm (1 pm: Keynote Address; 1:45 pm Panel Discussion; 2:45 pm Q&A; 3 pm Refreshments) at Javits Center, 655 West 34th Street, Manhattan. Panelist: • Umesh Goswami, Roche Group. He is Senior Manager, Corporate Environmental and Safety Affairs. Bio: Umesh Goswami is a Senior Energy Manager with the Roche Group. In his current role, Umesh monitors progress toward corporate energy efficiency, sustainable energy, and carbon-related goals. He also provides guidance to Roche affiliates and corporate functions on best practices in energy management, carbon footprint reduction, and energy efficiency standards. Umesh has 15 years of diverse experience in areas such as air quality and energy efficiency consulting, supply chain management, and chemical process design and development in the pharmaceutical and chemical industries. Umesh has an M.E. in Environmental Engineering from Stevens Institute of Technology, and a B.S. in Chemical Engineering from Northwestern University. He is a member of AIChE, and is a former Secretary of the Metro New York local section.